The mastic asphalt industry’s most impressive projects and professionals were recognised at the Mastic Asphalt Council’s (MAC) 2018 Awards hosted at London’s Royal Horseguards Hotel. Over 140 key players from the sector attended the event which is one of the most prestigious in the calendar for the waterproofing industry. Sponsored by Alltype Specialist Roofing Supplies, Academy Consulting and Sky Gardens, the awards present the ideal opportunity for the Mastic Asphalt Council to honour top projects and professionals across the mastic asphalt industry. The mastic Asphalt Councils says mastic asphalt has an illustrious history as one of the most established and well proven waterproofing membrane systems currently available, and the incorporation of modern polymers into mastic asphalt systems has helped lead to its resurgence in the construction industry. The winner of the John Blowers Award for 2018 was Mick Elliott of IKO PLC. Mick started his career as a Laboratory Technician and has played a valuable role in the development and production of polymer modified mastic asphalt. He became a member of IKO Technical Services in 2000 and is well known throughout the industry for promoting the qualities and benefits of mastic asphalt and for offering excellent advice and service to contractors, specifiers and clients. The John Blowers Award commemorates MAC’s long-serving director and secretary, John Blowers, who formed the backbone of the Mastic Asphalt Council for more than two decades before he sadly passed away in April 2016. 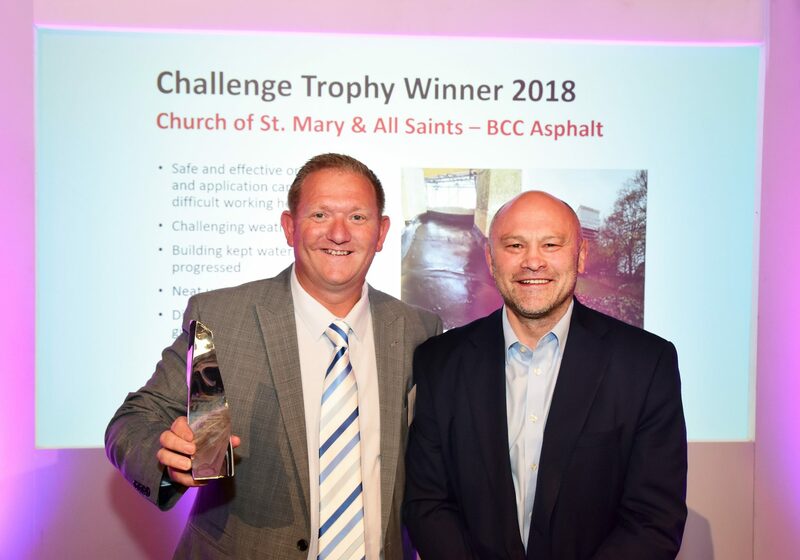 The Challenge Trophy Award was made to BCC Asphalt for the Church of St. Mary and All Saints project. This award recognises the most impressive project across the year carried out in the most challenging conditions. The application of mastic asphalt was carried out at a problematic working height in very difficult weather conditions. The building was kept watertight as works progressed and different contours and curves of gutters were expertly matched using mastic asphalt. 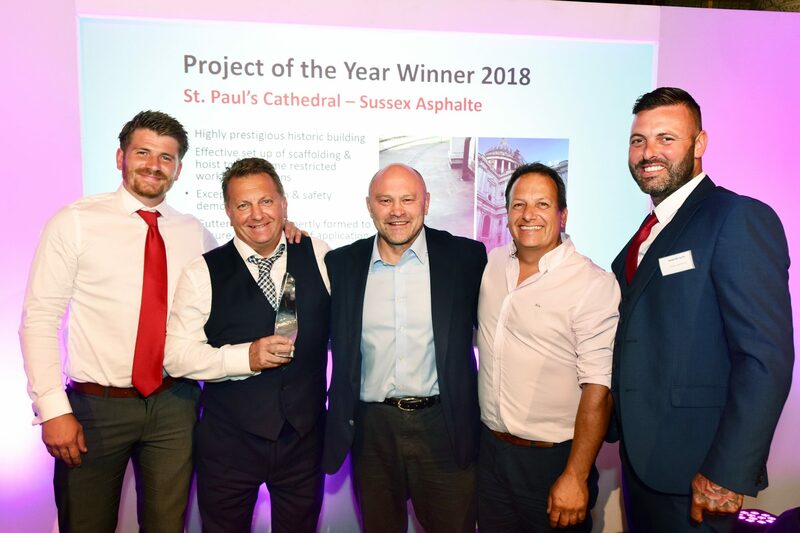 The final award of the event was the highly sought after Project of the Year Award which, in a field of outstanding entries, was awarded to Sussex Asphalte for the prestigious St Paul’s Cathedral project in London. Mastic asphalt was first laid in 1906 on the Stone Gallery that circles the Cathedral dome and it provided a remarkable 111 years’ weatherproof protection before it required refurbishment last year. Sussex Asphalte secured the contract to replace the asphalt around the Cathedral dome and completed the refurbishment of this historic building with excellent attention to detail and workmanship throughout, with neat upstands, arrises and splays. Scaffolding and hoists were used to overcome restricted working conditions and a gutter template was expertly formed to ensure the correct width of application. Other projects shortlisted for the Project of the Year accolade included Folkestone Harbour which was completed by Knight Asphalte; St Hugh’s Monastery which was completed by Sussex Asphalte, Merridal Court which was completed by Brindley Asphalt and Church of St Mary & All Saints which was completed by BCC Asphalt. Following the awards presentation, the attendees were entertained by guest speaker Brian Moore, who formerly played Rugby Union for England and is a well-known presenter and pundit for BBC Sport and Talksport. At the event, an impressive sum of £5,000 was also raised for Demelza Hospice which provides care and support for seriously ill babies, children, young people and their families, across East Sussex, Kent and South East London.